I saw an article recently titled, “Hospital datacenters: Extinct in 5 years?” that made my jaw drop just a bit. The race to the cloud is unquestionably taking place in just about every other industry. More than half of the CIOs polled at last year’s Gartner Symposium IT Expo are moving away from a captive data center environment and working toward a cloud-first strategy. The healthcare industry is notoriously the laggard in that migration and, up until now, healthcare’s race to the cloud has looked more like a slow walk. So, five years may be a bit ambitious. Even so, the healthcare cloud migration is gaining steam among hospitals and health systems today. 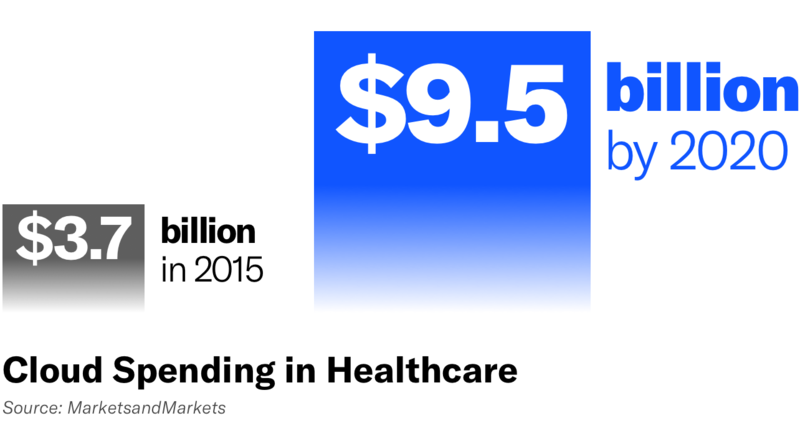 In fact, healthcare cloud spending is expected to rise nearly threefold, from $3.73 billion in 2015 to $9.48 billion by 2020. In this article, we explore the state of cloud computing in healthcare today, the benefits of cloud computing in the healthcare industry, and HIPAA cloud compliant hosting. CIOs and CMIOs across the healthcare ecosystem are feeling pressured to modernize quickly while keeping costs low. To follow are some of the key pressures driving accelerated migration to cloud computing. Across all industries, migration to the cloud is often a business decision to remain competitive by funding innovation. CIOs today are partnering with business department owners to help them find ways to shift funds into the things that really matter both to them and to the business strategy as a whole. Cloud usage at hospitals and health systems is often centered around managing business applications to achieve those financial efficiencies. It is not as simple looking at the costs of running those applications on-premise, in the cloud, or on hybrid infrastructure. The conversation between healthcare CIOs and their business leaders has to focus on how much value it brings to the business as a whole. The cloud makes it possible to hold more information and also do it a lower cost. This allows even the smallest hospitals access to the kind of storage that allows them to provide the most value, without a hefty price tag. Shifting to the cloud and decommissioning old servers means healthcare IT departments can shift that money to fund innovation projects in the organization. Healthcare today is rapidly shifting from a volume-based, fee-for-service model, to the newer value-based model outlined by the Affordable Care Act (ACA). In the value-based care world, providers are graded based on the value to the patient as opposed to the volume of services. To explain the difference further, the fee-for-service model, which has been the standard for a long time, rewarded physicians and hospitals for filling beds and conducting numerous tests and treatments. On the other hand, the newer, value-based care model rewards providers on cost-effectiveness and clinical case outcomes. This change requires rapid innovation that only cloud computing can cost-effectively provide. In addition to those changes in payment models, patients’ perceptions of value are quickly changing. To understand this, it’s crucial to think of patients as consumers, and those consumers are adapting to offloading nearly every aspect of their lives into the cloud. Our dependency on instant access to everything, from news, answers, and financial records to our social interactions, has changed our expectations in all areas of our lives. Along with this digitalization, consumers are taking control of their own data in innovative ways as apps track, store, and analyze personal data on everything from our heart rate to our credit score trends. From a consumer point of view, expectations in data availability are seamless from one part of their lives to the next. They not only expect to be able to access all of their own healthcare data, just as they do with their bank data, but they expect to be able to provide the data they’re generating with wearables and apps back to healthcare providers. Cloud computing enables hospitals and health systems to face the challenge of delivering more patient value. It provides them with a connected environment to exchange data with their patients. It also provides the means to handle the massive amounts of data that are growing exponentially in a cost-efficient manner. On-premise infrastructure costs are high and data scalability is more feasible in the cloud. Interoperability, both internally and externally, is a growing pressure on healthcare CMIOs and CIOs. Not only is there a need to easily exchange data between internal departments, for example, between an EHR and billing system, but there is also an increasing demand from consumers and the industry as a whole to be able to make patient data exchangeable with other organizations. Cloud computing as an IT platform facilitates information sharing across the healthcare ecosystem, enabling cross-industry services and making internal data exchange faster and more cost-effective. Healthcare consumerism is an underlying trend that ultimately makes cloud adoption essential to provider success. Healthcare organizations need to make very quick decisions about integrations and new technology. Their innovation centers require a quick, affordable, and secure platform to rapidly test while maintaining the confidentiality of patient information. That platform needs to be scalable as the size and quantity of data sets grow exponentially. It also needs to be interoperable for internal and external collaboration. These innovation demands are driving an acceleration of cloud computing in healthcare today. As hospitals transform to modern, digital enterprises and value-based payment models, they need to find innovative ways to quickly test and evaluate integrations and technology options. Cloud platforms allow for the agility and speed to innovate while lowering the barriers to innovation. “Healthcare is undergoing massive technological transformation. Datica’s approach to HIPAA compliance means Microsoft Azure customers can utilize trusted solutions to privacy and data security which meet the highest levels of healthcare standards. We’re excited to offer a HITRUST CSF Certified platform such as Datica in the Azure ecosystem.” — Nicole Herskowitz, Senior Director Product Marketing, Microsoft Azure, Microsoft Corp.
Healthcare data management includes strict requirements for security, confidentiality, privacy, traceability of access, reversibility of data, and long-term preservation. As hospitals and health systems race to quickly test and decide on ideas and applications that include everything from patient health applications to AI, they need a HIPAA compliant cloud hosting platform to build or test those applications upon. Datica leads the industry with the first, most complete HIPAA compliant cloud infrastructure. Datica Compliant Cloud is HITRUST CSF Certified on AWS, Microsoft Azure, IBM SoftLayer, and Rackspace, achieving the highest industry privacy and security standards across infrastructure providers. The challenges healthcare enterprises face persist and the benefits of cloud computing to help them face these challenges are too compelling to ignore. Cloud computing allows healthcare enterprises to access improved technology at lower initial capital expenditures than physical environments. As healthcare organizations enter the race to migrate to the cloud, the barriers for innovation and modernization become lower, information sharing becomes possible, and the value-based transformation can actually take place. Compliance in the cloud is a solved problem—we solved it. Innovative teams across healthcare, from hospitals to digital health startups, from life science groups to insurance companies, all trust Datica to reduce the risks of healthcare in the cloud. These big ideas in healthcare innovation explore a lack of interoperability, the role of EHRs, and how data standards like FHIR ignite transformation. HHS released its official Guidance on HIPAA & Cloud Computing last month. The guidance answers some lingering questions that people seem to ask. Chief Medical Information Officer is an evolving role in the executive suite. Learn about the CMIO job from Luis Saldana, M.D., CMIO of Texas Health Resources.